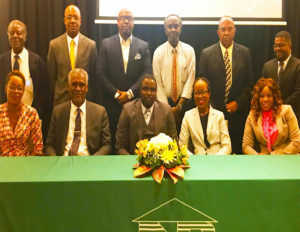 Basseterre, St.Kitts (June 1st, 2018):-The Leadership of the St.Kitts-Nevis-Anguilla NATIONAL Bank Group including the Board of Directors led by Chairman Alexis Nisbett have come in for high praises from shareholders . The commendation from the shareholders came at the Group’s 47th Annual General Meeting held on Thursday May 31st at the Park Hyatt Hotel-St.Kitts. The Meeting drew the largest group of shareholders in recent years with almost 400 persons present at the meeting. Chairman Alexis Nisbett gave an outstanding account of the Bank Group’s financial year and highlights. The young highly intelligent and knowledgeable Nisbett gave in detail, a laudable account of the group’s performance for 2017. The almost 90 minute presentation detailed the highs and lows of the Banks year in review and also gave shareholders an insight into the operations of the institution and the work of the the board of directors and the management and staff . Nisbett succeded Howard MchEcharane who led the organisation for years from 2015 to 2017. McChecrane along with Nisbett and the board of the Group all came in for lofty commendations. Chairman and added that the Group recorded net income of $39.5 million at the end of June 2017, which represents a 39.0% or $11.1 million increase when compared with $28.4 million in 2016. The Bank saw increases in Total Assets from the previous year as well as increases in Earnings Per Share. This is significant as the bank saw the highest earnings per share when compared with the last four years. Overall, the Group recorded improvements in most of the key performance ratios. For the 2016-2017 financial year, the Group has so far paid an interim dividend of $6.75 million or $0.05 per share in December 2017. The AGM saw the election of two new members to the board to fill vancancies left by the retirement of Theodore Hobson QC and the exit of for Former Chairman MchEchrane. Accountant Frank Maitland and Special Advisor to the NIA Lorna Hunkins were duly elected and will fill the complete the boards full complement of members. 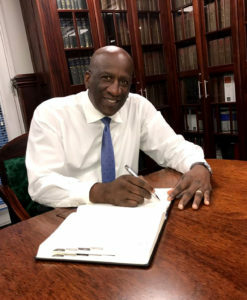 Directors Analdo Bailey, Wallis Wilkin and Elreter Simpson-Browne were all retired by rotation but were all re-elected to continue their service as board members. St.Kitts-Nevis Prime Minister Dr. The Hon. Timothy Harris hailed the success of the Bank and also hailed the leadership of the institution.